What do I need to get past the big Security Guard??? Before you even get up to the metal detectors you will be asked for your boarding pass and your id (yes, again). Say farewell at this point to any bottled water or drinks that you have brought with you. They will not allow these substances through security and you will be asked to throw it away. Be prepared to show off your new pedicure once you approach the scanners as you will be required to take off your shoes, as well as removing any coats, jackets, sweaters, and/or belts and put it in your special little bin that will take a ride through the x-ray scanner. Laptops need to be taken out of its case and put in a separate bin. 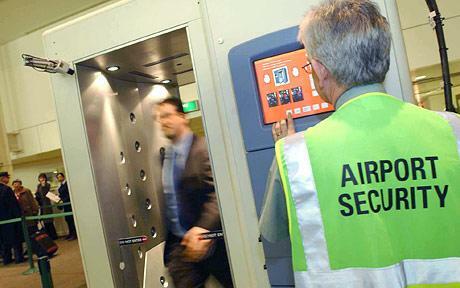 There is a security officer “on the other side” who will give you instructions as to when to come through the metal detector and believe it or not, what to take off. Be sure to keep your boarding pass in your hand and NOT in the bin. Also keep in mind that these officers are allowed to search you and your carry-ons at random. Medications are allowed on your carry on but only in a quart sized zip-lock bag. Do NOT pack your medications in your checked baggage. See the website listed above for the list of items that will be confiscated and you will probably be detained for having at the security checkpoint. Disposable cameras and film should be packed in your checked baggage as the x-ray scanners at the security checkpoint can destroy your film. From time to time however, they conduct random searches of your carry-on and will take their wand and wave it over you to be sure that you are not concealing anything. Again, it is at random so there is no way to predict whether you will get searched. Allowing yourself plenty of time for check in and security will take any pressure off that you might have had otherwise. If you have had any joint replacement surgeries (i.e.… knee, hip, shoulder etc) NOT INCLUDING YOUR DENTURES it is a given that you will frisked with the metal wand; and this will not be from your fairy godmother’s wand. It is a little known fact that airlines are not gentle with luggage, so anything that is electronic or fragile should be placed in your carry-on. What Will Get Me Through Security Faster? There is no one way to guarantee a speedy security experience as there are no VIP lines but you can help yourself and others speed your way through security by ensuring that you have your photo id and boarding pass out, and make sure to discard all beverages. You can help save time by having easily removable shoes, taking off belts with large buckles and jackets or sweaters before you get to the scanners. Be sure to pay close attention to your key ring if bringing your keys, as you may forget having nail clippers or other sharp objects on your key ring. If you are bringing a laptop you can make sure that it is easily accessible, as you will be required to take it out of its case. If you follow the security guidelines that TSA strictly enforces you should not be delayed in getting to your gate. Once again, Security officers have the right to search you and your belongings at random. This does not mean that something is wrong or that you are in trouble; safety is their job, it is nothing personal against you. © 2015 Heavenly Cruises. All Rights Reserved.